The JASC Water-Cooled Three-Way Purge Valve was engineered to prevent liquid fuel coking that typically occurs when valves are exposed to heat for extended periods of time while the turbine is operating on gas fuel. 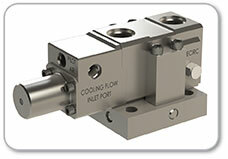 JASC’s new and improved Water-Cooled Three-Way Purge Valve features extensive internal cooling paths to keep critical components below the liquid fuel coking threshold. All-stainless steel construction provides increased corrosion resistance. 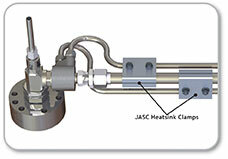 The JASC Heatsink Clamp is designed to move heat away from liquid fuel lines by utilizing the adjacent coolant lines while the turbine is running on gaseous fuel. With liquid fuel flow checked in close proximity to the combustor cans during operation on gaseous fuel, the liquid fuel can slowly cook down to sludge or worse yet form carbon deposits, aka coke, on vital components of the liquid fuel system. When liquid fuel is needed, the sludge or carbon is introduced into the valves and combustion nozzles affecting turbine performance. Now you can put the coolant lines to even better use. 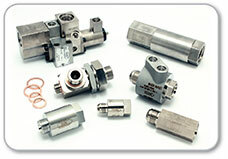 Provides reliable valve function so that seamless fuel transfers from gas to liquid fuel can be achieved. Check valve failures, flow divider failures, fuel system evacuation, exhaust temperature spreads and other backup liquid fuel system related turbine trips can be resolved with a variety of our patented designs.